Resorcinol is a wood specific 'bonder'. If you were gluing exterior mahogany rails up from strips and scarf joints there is no other glue. When you glue coaming blocks and winch islands up with epoxy you will have separation at some point. And as I just said if you have an epoxy glue-up like a bowsprit and/or teak anchor roller they are guaranteed to come apart. I don't know how long it'll take, but the more heat and wet/dry cycles they experience the sooner they will come apart. I'm talking about pieces of wood brought together into a structure. Epoxy IS definitely more versatile. You can glue wood together and seal it with the same epoxy. You can fill gaps and fillet, you can laminate fiberglass onto wood and foam panels with the same stuff. You could probably do a barrier coat on the hull with it. But, by definition, you only achieve a mechanical bond. I hesitate to use that term here as the adhesion is mechanical but not a BOND. There is no comparing here with Resorcinol which can only glue flat pieces of wood together FOREVER. It has a bad rap because of its short open time and need for high clamping and controlled temp. If I had been more comfortable with Resorcinol I might have done A-338's strongback lamination with it. I felt I couldn't do it within the short open time required. It is entirely possible to put together a new rudder for the Ariel/Commander with foam and glass OR plywood and glass using good epoxy. There is always the chance that the epoxy can separate from the wood or the foam. You have to take this into account when designing the rudder. But this is not gluing wood-to-wood. The whole intent is to encapsulate the wood - and it sometimes doesn't work. Exposed, varnished wood swells and shrinks. Epoxy glue-line is more or less non-shrink and hard. Wood wins. If you had to glue wood-to-wood together for underwater use (like the original non-encapsulated rudder) Nobody would spec epoxy. It's possible to butcher-block and pre-bond pieces together into 'planks' with Resorcinol for cutting the shape and use polyurethane or polyether for gluing/caulking edge to edge planks. Most people these days would then SEAL the wood with a thinned epoxy, then attempt to waterproof with a polyurethane coating (or whatever new comes down the everchanging chemical pike.) Or go right to bottom paint. Imco that's conventional wisdom. In every case epoxy must be protected with another coating. Even a novolac needs UV protection. Pigmented epoxy coatings/paints will chalk and breakdown. There is no comparison with LPU coatings Even polyester coatings will outlast epoxy coatings. On those winch islands use a clear coating with the highest UV rating you can find. That'll help some. The chemistry keeps changing. There are new combinations appearing: epoxy polyesters. epoxy urethanes and resorcinol epoxies, and ETC for both adhesives and coatings. Quite amazing. But at the moment everyday epoxies that we buy really have limited use on the exterior of a cruising sailboat. Please, I work with these assumptions on my Areil. If there are developments or stuff I've forgotten (more likely every day), please clue me and the boat in! We both depend on it. The limited info about glues and coatings that I work with IS ALL conventional. For unstressed gluing somebody by now must have tried using CLEAR polyether or a silyl-urethane. !NOT SILICONE! Also sold as Hybrid Sealant/adhesive. This is a one-part, low odor, 100% solids, long life, moisture cured, always flexible synthetic rubber in a gun tube. Worth experimenting - like gluing a stack of mahogany blocks together and boiling them for awhile!!! Last edited by ebb; 01-29-2010 at 08:10 AM. I really appreciate the time you put into your responses. The epoxy vs. resorcinol question is new to me. I understand what you're getting at. And I'll be sure to put 10 coats of Eplfanes on those blocks. I think many people including myself get involved with these old boats thinking that with a little repair effort you can have some fun sailing for a few seasons before everything wears out. Of course once you get started and develop attachments to the project you want the dam thing to work right and last. It is REAL easy to get really attached to these boats and want to do the absolute best job you can bringing them up to better than new condition. Furniture I've built since I could reach the top of a tablesaw. But doing the job right on a boat is a whole new learning curve. And thanks to this place I'm getting an education. and the boat design forum. The second site seems to be sat on by guys like me who dog onto every new post and subject. I have a problem with them because what they say, often with something off color, is hearsay and somebody else's opinion - not even their own. They're comedians. And always NOT funny. I don't go there anymore. The WoodenBoat Forum seems more sane. Inquiries are often by first timers so the experts who answer are likely to be basic and simple. On the designforum you will find those who put Larry down - for whatever reason. Larry at one point took at least one epoxy manufacturer to task for making false claims about the product. You no longer will find data sheets that say the epoxy is waterproof. Or stable in a cruising environment. I listen to them and ignore the jealous marina rats who can only put them down. Both Resorcinol and epoxy have their limitations. The first because it is a technical glue. And epoxy because its versatility lulls people into ignoring its limits. We all labor with what we know - what we think we know - what we would like to know - with modern chemistry and with traditional ways of thinking and working, I don't believe any thread with prejudices and opinion is convincing. So try this one on for size and follow it through to the end. It's on the www.woodenboat.com forum. And this is a "flog the dead horse" subject for many of these guys. This thread has a bunch of boat builders and amateurs talking about this subject. Not all the bases are covered but the thread is revealing and will help you come to an understanding of the problem. Last edited by ebb; 02-02-2010 at 06:46 AM. My resorcinal will show up here Monday from Jamestown. The mast beam on my soon paid for A-273 shows no immediate signs of deterioration, but I thought a fun project on an otherwise quiet late afternoon would be to make a door way arch to further strengthen an already strong little ship. This contraption will be bolted on to the vertical members of the doorway, with the ends resting on cut-off pieces of trim. It will also be jacked up snug against the beam, with just a short bronze rod to index it. It is made of ash, 17 laminations, and measures 1 5/8 square. Should have been one more layer, but when it was all clamped up I saw number 18 lying over in the firewood pile.. It will lower the headroom in the doorway, but at 6'3" I'm already crawling around in there. So, what's the glue? The big question, right? Subject of many discussions here and elsewhere. Well, contrary to other folks experiences (friends and internet experts) I used Gorilla Glue. Why? Wanted to do this thing right now and besides epoxy it was all I had. Living 65 miles from the nearest city limits your spontaneity. Since it is strictly not necessary it can acts as an experiment for Gorilla glue without dire consequences. My son did the tops'l schooner (at least that's what he calls it) when he was 9. Last edited by jan nikolajsen; 03-29-2010 at 10:51 PM. Nice arc! That will look 'shippy' in place. Heck, looks nice just sitting there. Do you have any other plans fro changes aboard? As I have mentioned before I plan to remove my commander compression post and replace it with a strongback. So today I started reading some of the prior posts to determine the demensions I should aim for on the strongback. Then I started measuring my commander and it seems that there are some differances between the the two boats in the amount of curvature of the deck unless I'm missing something else. The drawing on page 23 of the manual shows the bottom of the strongback as a straight line from one side of the cabin to the other (or so I assume since the full width is not shown). ebb said that his original strongback was 4-1/4" tall in the middle and tapering to 2-1/2" tall at the ends and 2-3/4" thick. If ebb's original was straight accross the bottom, that would indicate there was only 1-3/4" of camber from the edge of the cabin to the center. ephifany said his original was only 3-3/4" tall in the middle but from the picture his does not look like it was flat on the bottom. So I may be making an assumption I should not. In any case, I have 4" of camber in my deck. I placed a straight edge accross the cabin touching the bottom of the deck on each end and in the middle I had a rise of 4". So I will not be making my strongback straight across the bottom. If I want to end up someplace in the 2" thick area on the ends that means it would extend down 6" in the center. That is a bit much IMHO. Below is a sketch of the approx. layout I'm looking to do. I plan to make it from 3ea. 4/4 boards of white oak laminated together vertically with resorcinol which will give me approx 2-3/4" thickness. I will butter the top of the strongback prior to putting it in place with thickened epoxy and then tab it to the deck and the bulkhead supporting it which will also be tabbed to the hull and deck. And of course I will have white oak bracing on the v-birth side which will be covered with 1/4' mahogany plywood as will the aft side of the bulkhead. Any suggestions or comments about the plan? A man can succeed at almost anything for which he has unlimited enthusiam. Jerry, Just took another look at the old strongback that came out of A338. It isn't straight across on the bottom as you might think because of the doorway to the forward stateroom. The original door was cased. In fact the top liner of the opening is often the first indication that something is going on under the mast. So the strong back definitely looks curved top and bottom - until I sighted along the bottom and saw that the mid part had been flattened (looks like with an AX) obviouisly to square the doorway. I laminated my 'upgrade' and later decided that it would have been BETTER and SIMPLER to bandsaw the beam out of white oak. And so easy to make the slight chamfer along the top to snug the cabin top. Commander's have a COMPRESSION POST. My guess is that the fiberglass of the cabintop can be kept honest with a plain curved beam top and bottom. In other words I think you can skinny the beam depth as long as you still support the center with a post. I might make the beam a little WIDER - to make up for the cheat. The beam on the Ariel is 4' long. Not much to get bent even with a point load in the center. In fact, bet there never has been an actual bent beam in any of our boats. Yesterday's Alberg Assoc breakfast there was talk of the Triton's beam getting pressed down and the cabin sides getting pushed out!!! Could see the bulging! That just wouldn't happen with our cabins. Making sure our shortie is married to the cabin top will imco cancel the remotest possibility of that happening in a Commander. I'd make certain the center post cannot move. Actually you could scroll into the beam a PAD in the center over the post, to fatten the beam there if you want to skinny it down. You'd do this all at the bandsaw, right? no gluing in anything extra. That would remove any tendency to bend. In other words, leave the beam deep in the center but scroll out the sides to remove head bangers. Really round the edges, someone's going to head the beam anyway! In a modern 'engineered' mast compression POST set up they'd probably just have a disk of some material under the mast - with no beam at all!!!! Last edited by ebb; 07-12-2010 at 07:50 AM. ebb thanks for the feedback. I'm always interested to hear what you have to say. So the bottoms were curved also. That explains a lot about the dimensions. ebb, you may have missed that my whole reason for doing the mast beam is to eliminate the compression post. The unsupported portion of the beam in the center will actually be less than 2 foot wide when my mod is complete. BTW the Precison line of sailboats made here in Florida are current production models with mast support beams that are made with plywood laminated together and then glassed to the bottom side of the deck. They have only a small portion of the beams ends supported by a plywood bulkhead that is just screwed to the beam. You can see it a little bit in the picture of my old Precision 18.
assume is the mother of all foul ups. The key still is we can have nothing move under the mast. And each of us has our own unique solution it seems when we stray from the box. I love the sweet lines of the Commander. The curve of the cabin roof is particularly pleasing. Maybe, maybe it's possible to design a kind of 'break water across the cabin under the mast. If it wasn't a breakwater but a rounded slope sided and gel-coated mound it might just disappear and not mess with the lines. Last edited by ebb; 07-12-2010 at 08:36 AM. In discussing sailing Ariel Spirt, one of the possibilities was the idea of sailing her to Puerto Rico. As I considered what I would want to do before undertaking such a journey, the thing that came to mind first was to address the strong back. I like the idea of the stainless plate sandwich, but getting the stainless bar and having it polished before getting underway was not going to work. I like the earlier post about using large aluminum angle, but hate hitting my head on the doorframe. Add to that Ariel Spirit has the original bright work trim around the door, which I would not want to mess with that. 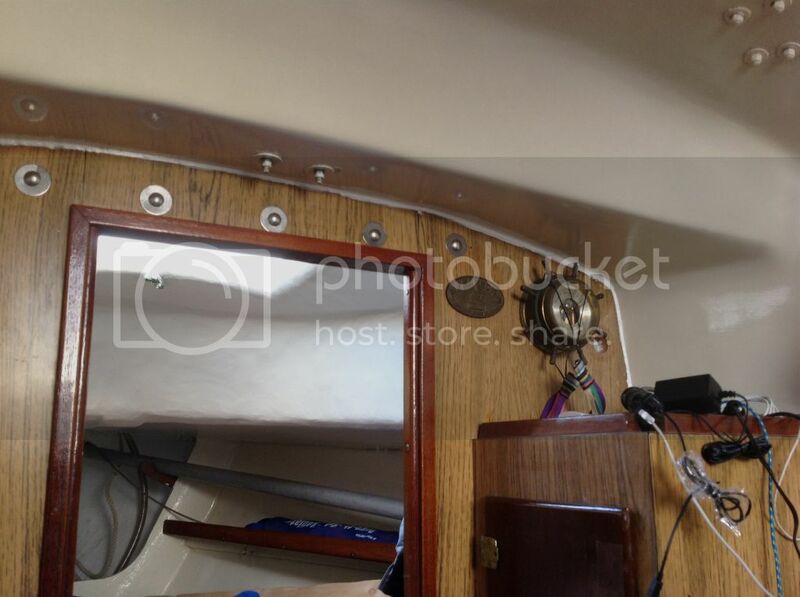 Used 5, 5/16" stainless carriage bolts with the smooth sides and stainless fender washers on the cabin side. Not a bad look, and very strong. I like the angle because the extra angle will prevent the bar from trying to twist. The difference in what I did was that I put the "extra" bit on top. I a very pleased with the way it came out, will post a couple pictures later. Just learned the person in NC that was buying the boat is going in another direction, so I am getting underway in a bit to sail the ~140 nm across the big bend... Glad to have addressed this before heading off shore. (Also visible is the replacement plate from Bristol bronze). Craig, Looks right on, the AL angle, great idea. Don't forget the cabin laminate has a balsa core on top. Ended up cutting something like a 1'X1' square of A338's cabin top out and replacing it with solid layup of glass. 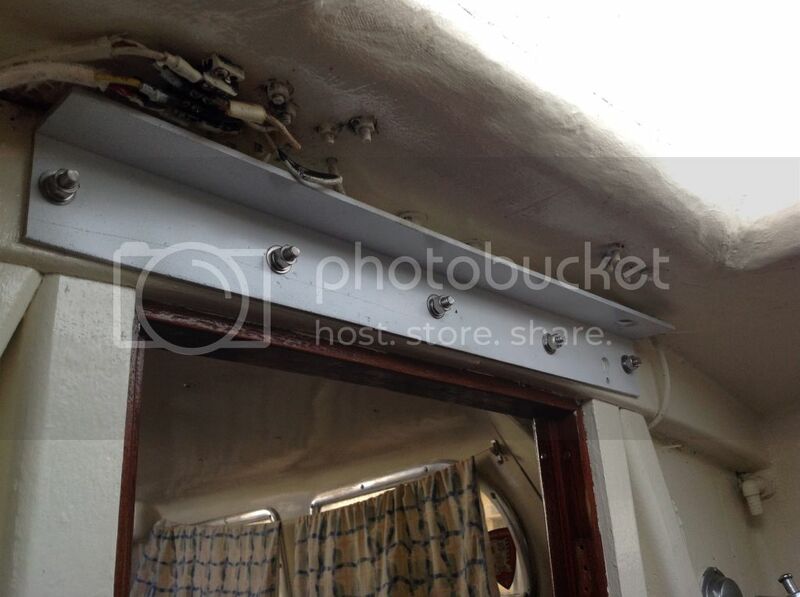 The original mast electrics hole had invited rain water in which caused balsa rot. Balsa did not rot in the '60s. Whose idea was it to put balsa under the mast? Discovered this with the mast removed and springing a batton over the top. Could see the top was flattened. But also, later discovered that the damaged composit had sprung back almost to its original curve. The cabin top was crushed mostly just under the maststep where the core had rotted. Inside, could see that the strongback had a space over its top - with the mast removed - and the composite returning to its original curve. Found that all Pearson support framing on the bulkhead was only screwed together. the factory support framing (which was NOT glued in) also had settled, SHRUNK, if you will, over time. The white oak beam I took out of A338 was in original condition....NO ROT....STILL CURVED....NOT FLATTENED in any way. And I still have it somewhere in the garage to prove it. Pearson used the strongback also to squeeze and hold the forward part of the cabin liner in place. So on the V-berth side of the beam there was wider space between it and the cabin laminate because no liner inside. And Pearson, had slipped in some sort of funky shim pieces to make up the difference. Not wedging, just filler. But, like I say, the beam had air along the top. The 4' beam is also bandsawed square, while the cabin top is angled. They had also, in A338, misalined the liner when assembling, and the interface was a really wierd mess to look at. Not really knowing what was going on when trying to figure it out the first time - too funky to believe. Have to conclude the assembly was never tight to begin with. But over time Ariel has proven to be forgiving, anyway! Think everything in the beginning was loose as a goose. But cinched up bent out of shape by the shrouds over decades. Cabin top is thick laminate and a pronounced curve. Not easy to flatten. Most A/C's are only sailed seasonally and on weekends, sit unused in marinas, they rest alot, and don't see much bluewater. I found nothing positive with the B-grade plywood bulkhead*-oak beam-and fir framing stuff to keep the mast from flattening the cabin. If the core is not rotten, then, perhaps all that is needed are well shaped shimes or wedges tapped in along the top of the strongback. *the plywood 'bulkheading' across the doorway was a separate piece, a space filler doing no work. CONSIDER THIS....If I remember, the vertical 2X framing at the V-berth doorway - SEEMS to support the strongback beam - but stops on top of the V-berths. Could say the V-berths themselves (some cleats & plywood tabbed on one side to the hull) and a few wood screws are really what is holding the mast up. In fact, that's what Pearson did in A338. So again. in my opinion, quick-n-dirty mechanical construction...... just settling over time. Imco, the aluminum angle will help stabilize the inward pressure of the mast. But you still may find the shrouds loosening with passage sailing. Hopefully not! MORC (Pearson designated: Midget Ocean Racer Cruiser) sounds more like a goblin... than a pretty Alberg sloop. Last edited by ebb; 06-26-2014 at 09:10 AM. All those wires inside my mast gotta go!